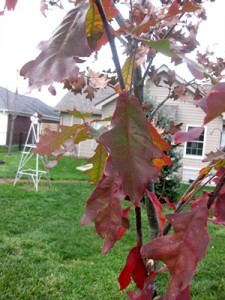 Question: Is Replanting Trees in Oak Wilt Disease Infected Area Possible? Question: I just finished cutting down the last of my backyard oaks due to oak wilt. I have also lost several redbuds due to vermicillium wilt. I would like to replant a tree in the spot where the oaks and redbuds were, but I would like some advice on the most resistant tree I can find. I live in Crown Point, IN, primarily clay, on a slope, with heavy brush on my property lines. I know most people would say NEVER plant again once wilt has been detected, but I thought I might ask before giving up (and moving all my shade plants). Do you have information/research on an appropriate and sturdy replacement shade tree? Response: In general, replanting of oaks in an old oak wilt disease center does not result in disease occurrence in the replanted trees. Root grafts are not thought to form with the dead, diseased oaks. It does not appear that the fungus is transmitted outside the primary phases of transmission: vector-borne via insects (e.g., Nitidulidae) and xylem-limited disease spread via live root grafts of infected trees (MacDonald et al., 2009). This does not mean, of course, that the young oak trees as they grow and age over time are immune to oak wilt; rather, it simply means that oak wilt is not sitting dormant in the soil waiting to attack newly planted or germinated oak seedlings. Thus, it is only through insect spread from active oak wilt centers in the vicinity that disease would occur in replanted oaks. Healthy oak trees are not susceptible to oak wilt in an infected area. Bur oak, white oak and other members of the white oak family are resistant to the fungus and can be planted in oak wilt centers. For additional prevention measures, plant tree species other than Oaks to guarantee no infection from the disease.